Previous ArticleWho Do We Trust In? If confession is that important, and I believe with you that it is and more, then why is it the only time confession is offered is on Saturday afternoon? 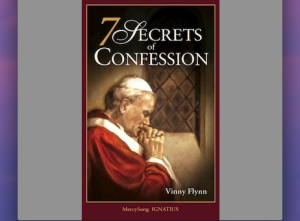 Why is it so impossible for confession to be available everyday as it ought to be? Part of the problem with people is that there is only that one day, when in fact, God’s mercy might wanting a person to confess at a specific time other than Saturday? The Church ought to sit up and realize its own fault in people’s aversion to going to confession. You are can to call a priest and set an appointment to confess your sins. My experience is that if one needed to, one would have to try to catch the pastor as he is rushing out the door to go to a meeting somewhere and could not grant the request for confession. I suppose if we had more priests that would make it more feasible. It is a shame because there is so much grace in the sacrament and it is very much worth the effort to try to be more available. Just in case you were curious, I do pray very much for priests. Some could help themselves by delegating more things to their councils in order to have time for ministry. In other words, I am not so much critical of the Church and hoping to encourage more attention be paid to the sacrament. By the grace of God my parish has confession everyday and the priests are always available any time as you need. I always pray for them and they are wonderful and Holy. I am grateful, but if we can do better we should benefit from being encouraged to do more. It is not always possible to attain the ideal. Without anyone saying anything how does any organization improve or attain higher goals? I am disappointed that you would not see the obvious. It seems the spirit of reform in the person of His Holiness Pope Francis cannot criticize but be relegated to nice speeches and then we return to sleep. Remember that after Jesus wept bloody tears in Gethsemane, He was abandoned by His closest companions and the passion began in full force. His passion was suffered in order to awaken us to His plan. We cannot accomplish His will while sound asleep. I think you have less to fear from my criticism than the Church had to fear from Martin Luther and in our own day, the Muslims who burn our churches. If you are incensed that I say confession should be available daily, what will happen when you are asked to renounce your faith or be beheaded? There is worse than criticism in this world and its getting worse.